An oasis of calm nestled in a lush garden setting, this 254 room hotel is furnished with 1,500 Asian art pieces over 20 floors, exuding the ambience of a grand private residence. Facilities include a lobby with a 24-hour reception, a currency exchange, lifts, a cafe, a shop, a bar, restaurants and public Internet access. Services provided include 24-hour business services, secretarial services, translation services, complimentary shoe-shine, as well as children's amenities such as children's bat. 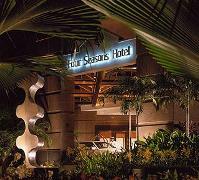 Location: Located on the tree-lined Orchard Boulevard, the Four Seasons Hotel is linked to the business, shopping and entertainment section of Orchard Road via an air-conditioned skywalk with a promenade of international boutiques. Conveniently located to key business and financial districts, the hotel is a five-minute walk to the Orchard Mass Rapid Transit (MRT) underground station and just 22 km from Changi International Airport.